What Makes Spinach Such a Powerful Superfood? Foods like kale and chard have taken center stage as greens worthy of the title “superfood”, and they’ve rightfully earned their spot in the light, as they are both packed with a wealth of benefits. But in the wake of these lesser-known greens moving towards the front, let us not forget the original green superfood: spinach. There’s a reason restaurants that once only served iceberg now have spinach salads on the menu, and it’s because more people became aware of just how good these leaves really are. Popeye knew it could help boost muscular strength, and research has even found the green veggie to prevent vision loss and protect against macular degeneration. In addition to all of the health benefits, spinach is versatile in the kitchen, reasonably cheap, and easy to grow. So, with new and more obscure greens popping up—don’t forget about the spinach. What makes spinach so great? Let’s start with its anti-inflammatory properties. The phytonutrients within spinach are both anti-inflammatory and anti-cancer. Inflammation being a risk factor for cancer means that spinach can help protect the body at a cellular level from life-long disease. An early study in the late 1990’s showed a decreased risk of breast cancer among women with the greatest intake of spinach. Similarly, extracts from spinach used in lab experiments have been found to slow down cancer cell division. Vitamin K is another positive component within spinach, with the veggie containing a whopping 181% of your recommended daily allowance of vitamin K in 180 grams of spinach leaves. What does vitamin K do? It’s beneficial to bone health on a few different fronts, and is also needed to proper blood clotting. Here are 5 vitamin K deficiency symptoms. Spinach has been around for ages, used in traditional Ayurvedic medicine throughout. In that field of healing, it’s seen as a headache remedy and a way to better your complexion. It’s even used as a remedy for insomnia. 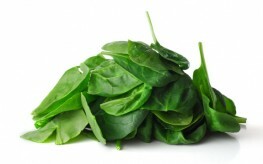 Raw spinach is a great way to reap benefits, but know that raw spinach contains something called oxalic acid. Oxalic acid can be damaging to blood vessels and can negatively impact people with arthritis and gout. Boiling the spinach can reduce oxalic acid while also allowing you to eat more (because spinach wilts so much with cooking). Whether you have it in a salad or on the side of your meal, spinach is a superfood that deserves a constant place in the spotlight and your home. no wonder popeye is si strong…coz this wonderful superfood is his favorite.